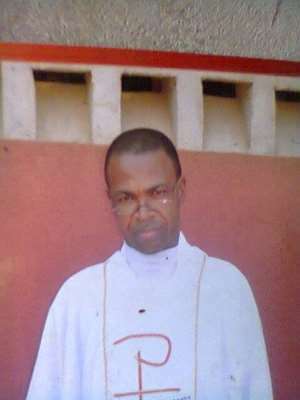 For over two years, there had been a rift between the Catholic bishop of Awgu Diocese, Rt Rev John I. Okoye, on one hand and St Theresa's Catholic Church Mmaku as well as their son, Reverend Father James Ani on the other hand. The rift came to a head on Tuesday 24th of September, 2013, practically fulfilling the biblical statement in Matthew 24 verse 7 that “father will rise against the son and daughter against mother”. On that fateful day, the Enugu State police command on a calculated frame-up arraigned Fr. James Ani and three other sons of Mmaku community on seven counts in two separate charge numbers: MEN/530c/2013 and MEN/531c/2013 before an Enugu North Magistrate court presided over by Chief Magistrate Grade II, E. M. Egumgbe (Mrs) sitting at Court 7 on charges of armed robbery, kidnapping, attempted murder, conspiracy among others in a holding charge. All of them were remanded in prison custody after the charges were read to their understanding. No plea was taken because the court had no jurisdiction to try the offences they were charged with. The charges read in part: “That you Rev. Fr. James Ani, Ugwu Marcel, Obasi Felix and Nobert Eke and others now at large on 18th day of September, 2013 at Imeohia, Mmaku village in Awgu magisterial district did conspire amongst yourselves to commit felony to wit: armed robbery and attempted kidnapping. You thereby committed an offence contrary and punishable under section 6(b) of the robbery and fire arms (special provisions) Act cap R11 LFN 2004. “That you (names mentioned above)… while armed with offensive weapons such as cutlasses, machetes, and sticks did rob one inspector Cosmos Nzeribe of his service pistol, Makarov-type with its eighteen rounds of live ammunition, his eighteen thousand naira and you thereby committed an offence punishable under section 1(2, a) and (b) of the armed robbery and fire armed (special provisions) Act Cap R11 LFN 2004. Also on Wednesday 25th of September, 2013 the police arraigned supporters of Rev. Fr. James Ani who had come to the court Tuesday to show solidarity with their priest only to get arrested, on another seven counts in two separate charges Nos: MEN/533c/2013 & MEN/534c/2013. They were arraigned before Magistrate Emma Nwalu of Court 9 in Enugu North magisterial district, and subsequently remanded in prison. Father James Ani was arrested on Saturday 21st of September, 2013 by the men of state criminal investigation department (CID), on the allegation that he incited his followers to beat policemen who were sent to his parish to ask questions on the on-going fissure between him and his bishop. The state police public relation officer (PPRO), DSP Ebere Amaraizu in his reaction said, “The priest was arrested for allegedly using his boys to fight policemen who were sent to his parish to ask questions on the on-going rift between the spiritual leaders”. Before his arraignment in court, Father Ani was denied audience with his lawyer and every other person that came to see him in the police cell was detained and charged along with him. But the church parishioners at Mmaku told our reporter that the charges against Fr. Ani have little to do with what happened at the alleged theatre of the offences. It was gathered from Mmaku that seven hefty men had arrived the parish house on the date of the alleged offences in plain clothes making suspicious moves, but Father Ani was not in the parish house when they arrived. In a recorded statement allegedly made by these men in plain clothes who refused to disclose their identity, and played to our correspondent, the men confessed that they were bought to kill Father Ani because all effort to remove him from his home parish, St. Theresa's Catholic Church by the people who sent them had failed. An eyewitness who elected to remain anonymous for security purposes told our correspondent that on Thursday18th, September, 2013 at about 11:20 am two Toyota Corolla cars with registration No XY 770 ENU with inscription 431/P and Toyota Corolla car No KPP 450 XA with inscription 1848/P with Enugu yellow and black commercial cab colour came into the neighbourhood of the church. According to the source, “I was seating at the front of our gate watching people working for us when two Enugu coloured cabs passed following each other closely. When they passed, I thought they were going for a wedding because the people inside the cabs were men altogether. “Shortly after the cabs passed, I took a gallon to go and buy fuel at a junction popularly called 'Afia Okporo'. I had not gotten there yet when I saw the cars parked about two poles before the junction. On approaching where they parked the cars I saw some guys arguing with two of the occupants of the cabs. When I came close I saw that five of the men had gone to the parish house where Father James Ani is living, about five poles away from the junction. This reporter however observed that from where the two cars were parked to the parish house is about seven to eight poles in-between. The two drivers were standing beside their cabs. “They went to the parish house, but while they were going, some ran and surrounded the building. We were watching them because the house is on the hillside. About fifteen to twenty minutes later, they started coming down from the house, two people standing at the entrance of the Church, however, were approached by some boys who seemed to be questioning them apparently bearing in mind an earlier kidnap attempt on Fr Ani perpetrated by his fellow priests in 2011. “Meanwhile, as the five people who had gone to Father Ani's house were coming out, one was overheard telling someone on phone that they 'didn't meet the man' and that their mission was fruitless,” disclosed the source. Sources at Mmaku told this reporter this conversation increased suspicion that the men in the cabs might have been assassins or kidnappers paid to come and kill Father Ani. In turn, this suspicion prompted the insistence of youths of the community, who had been attracted by the presence of the strange men, to demand the true identity and mission of the cabs' occupants, as well as who sent them. “When I came close I was hearing one of the guys telling them, we don't know who you are and your movement was suspicious. You parked your cabs on the road about seven poles away from the Father's house. We want to know who you people are. One of them told the already increasing crowd, we don't have any reason to tell you people who we are,” corroborated another source at Mmaku. Following the mounting pressure and attendant consequences of not disclosing their identity, one of them pulled out a pistol and released two bullets, one of which hit one of the village youths. Then others pulled pistols from their waists. Immediately, there was pandemonium. The sound of the gun-shots alerted many other people in the community. The villagers quickly blocked all entrances leading in and out of their community; and, as if by divine providence, one of the escaping cars stalled. “When they could not continue with the cars, they abandoned those vehicles and took to their heels. They were running and shooting. Luckily five of them, including the drivers of the vehicles were caught and interrogated. The pistol collected from them was later released to Awgu police command when they were invited. “Two of others snatched one motorcycle from an Okada rider and ran away. And till now, the motorcycle has not been found,” said the source. All the people who spoke to this reporter on condition of anonymity corroborated this eyewitness' account. Our sources also disclosed that when the strange men were interrogated, they confessed that they were allegedly sent by Engr. Patrick Orjinta, Barr. Cyprian Anikene, Prof. Eric Okolie, Engr. Emeka Chukwu Ekwe, Daniel Chukwuorji, Barr. Ede Chime, Anthony Orjigbam, Mrs. Anthonia Ojoecham, Ikechukwu Udeafor and O. J. Chukwuike to take Fr Ani away from St. Theresa's Parish, Mmaku. In the course of interrogation by the villagers, the strange men confessed, on record, that “the people who sent us don't want Father James in St. Theresa's Parish. They said he is disobeying the bishop and he is no longer a catholic priest and can no longer occupy a Catholic Church house”. A reliable police source from the Awgu police division told our reporter that though the men were policemen attached to the state CID they were, however, on an illegal mission. According to the source, “the case in question is a religious one that even I know was in court. Some reverend fathers were in court for alleged kidnap of Fr. James Ani in 2011”. The source blamed those policemen for acting in a suspicious manner by refusing to disclose their identity even when the community requested to know who they were. Adding that to make matters even worse, they also shot somebody in the course of their illegal assignment. The travails of Rev. Fr James Ani began when he compassionately stepped in to save from imminent death a senior seminarian Festus Ekwe. Ekwe, a native of Mmaku like Father Ani, had been abandoned to rot away at the University of Nigeria Teaching Hospital (UNTH), Ituku-Ozala by the leadership of the Awgu Catholic diocese following an August 2009 motor accident that affected his spinal cord. Spinal cord cases are not the speciality of the UNTH; and, cognizant of which fact Fr. Ani transferred Ekwe to MEMFYS hospital, a facility that has more specialist competence on spinal cord injuries. Following Ekwe's ordeal, Fr. Ani also expressed concern with the public policies of the bishop of the Awgu diocese, Rt. Rev. Dr. John I. Okoye, and requested a discussion of those concerns for the good of the Catholic Church in Awgu. In response, Father Ani was on 25th September, 2010 in letter signed by the bishop asked to vacate his post, then as parish priest at St. Stephen's Parish, Umuagu Inyi in Oji-River LGA for allegedly challenging Bishop Okoye's authority. He was subsequently sent back to his home parish of St. Theresa's, Mmaku on 27th of September to serve out the mandatory leave imposed on him by the bishop, through another letter signed by the Vicar General Fr. Mathew Eze. His service at St. Theresa's was meant to serve as a four months leave; but after general posting of priests of Awgu diocese at the end of the one-year period of punishment, Fr. Ani was not given a parish. The incumbent parish priest, Rev. Fr Nnaemeka Okolie (also known as Santa) was also transferred out of St. Theresa parish and a new priest Very Rev. Fr. Cyprian Orji was posted to St. Theresa's parish for a second tour of duty. It was reliably gathered that the Mmaku Catholic community which had not been satisfied with Fr. Cyprian Orji 's first duty tour in the parish sent a women delegation, mainly from legionary, to the bishop, the diocesan vicar and the newly posted priest himself requesting that another priest be given to them instead of Very Rev. Orji. An Mmaku indigene with deep knowledge of the issue at hand, Mrs Doris Ani, popularly known as Sister Doris, told our correspondent that the bishop refused the plea of the Mmaku people regarding Very Rev. Orji and told them that Orji must be their parish priest and that they should drive Fr. Ani whom he described as mad away from the parish house where he had been staying since September 27, 2010. The entire Mmaku Catholic community, however, insisted that, that particular priest (Father Orji) would never come to Mmaku again; and, that their son Fr. Ani, whom the bishop defamed as being mad, should rather stay with his people so that they, his people (the members of Mmaku Catholic community whose son he is), would take care of him. They insisted that it be so, taking a cue from Mark.3:21 where the Lord Jesus Christ was similarly defamed as being mad, and was taken care of by his relatives. “However, on Friday February 4, 2011 some Catholic priests identified as: Rev. Fr Nnaemeka Okolie (Santa), Rev. Fr. Victor A. Ozonoh, Fr. Calistus Onyia, Fr. Kennedy Udeh, Fr. Cyprian Orji, Fr. Lawrence Eze, Fr. Emmanuel Anugwa, Fr. Dr. Anthony Okeke, Fr. Israel Obasi, Fr. Kingsley Ude and Fr. Titus Ude all from Awgu diocese invaded St. Theresa's Catholic Church Mmaku and parish house in the early hours with guns, machetes and batons to kidnap the Rev. Fr. James Ani and inject him with medically confirmed substance capable of making Fr. Ani mad. Some of the youths of Mmaku were also arrested and detained by the police at the instigation of the said Rev. Fathers,” said Sister Doris. The objective of the said priests, according to Sister Doris who said those priests who came to kidnap Fr. Ani equally assaulted her and striped her naked in the church too that early morning , was “also to burn the parish house and allege that it was the priest (Father James) in his madness that set the house ablaze”. She explained that since St. Theresa Catholic Church was the home church of Rev. Fr Ani; and since he had been officially asked by the bishop, after branding him as mad howbeit without any medical examination or proof, to stay in his home town on administrative leave after; and, since he had been barred from staying in any other parish house within Awgu diocese, then they cannot also reject him. Against this backdrop she said, the Awgu diocese allegedly directed that no Mmaku son be given admission again into the seminary; and that Mmaku parish would be suspended from Awgu diocese. It was gathered that less than 20 per cent of the members of Mmaku Catholic community became intimidated and were cowed into supporting the bishop's bid to drive out their son, Fr. Ani, against the will, the tradition and consent of the people from his home town where he was ordained priest in 1993. This acquiescence of this 20 percent membership, our reporter was told, runs against the will of the entire people of Mmaku, Catholics and non-Catholics and even non-Christians, a corroboration of which this reporter saw from a protest the women of Mmaku community staged to the offices of the Enugu Correspondents Chapel. But notwithstanding the Awgu Catholic bishop's opposition, Rev. Fr. James Ani had been celebrating holy mass for his people since the bishop had refused to give them another priest or transfer Fr. Ani to another parish. On Saturday September 21 at about 5.30 in the morning, policemen in their hundreds swooped down on people inside the church celebrating mass. They arrested Fr. James Ani and striped him naked in the church, witnesses say. They also picked a young man on sick bed in nearby hospital. Not less than 35 people were arrested including men, women and the catechist. They were all taken away to Enugu and Fr. Ani was bundled to Enugu stack naked. It was reliably gathered that a woman police, identified as Jane Obiazo allegedly poured sand on the mouth of Fr. Ani accusing him of disobeying his bishop and taking money belonging to the bishop. It was further gathered that the police has been extorting between N25,000.00 and N45,000.00 each from the families of those arrested for the bail. The height of it all was the arrest of somebody on sick bed in a hospital. The parents of the young man told our correspondent that N10,000.00 was extorted from them before he was released on bail. Other people who had already been released on bail told our reporter that they were forced to sign a confessional statement written by the police which reads that Fr James instructed them to beat policemen and that they were kidnappers. One of them who said he opted not to sign was brutalized by the police and he quickly signed the statement. Barrister Raymond Nnaji counsel to the Fr. Ani, described the arrest and manhandling of Fr. Ani by the police as unfortunate and unwarranted in the first place. He said defiling the worship centre and stripping a man of God naked inside God's house was the height of impunity that can be committed by a law enforcement agent. Nnaji who said he had been following the matter since 2011, noted that the matter has been in court, just as he condemned the beating of the policemen, though the priest has denied having business with the alleged assault on law enforcement agents. While expressing disappointment with the police, Nnaji said, “Nobody has looked at the situation; you are trying to look at the effect without looking at the cause. What gave rise to the police being manhandled? What gave rise to the destruction of the vehicle the police were in? It is a problem in the church”. “The Rev. Father had problems with the bishop and the police brought themselves personally into the arena of conflict and it gave rise to all these problems. And the police actually used the opportunity to manhandle the priest, stripped him naked, detained him and did not allow access of lawyer to him”. Nnaji, an ardent Catholic said it was very unfortunate that such a thing would be happening in the Catholic setting. “I believe that when you have problem you go to the church to seek solution and when the church has problem so what will happen”, he queried. “A bishop that is supposed to be a father; he hears confession everyday from people who are bad, he hears confession everyday from people who wrong others. Assuming we are using the word of the bishop that the Rev Father misbehaved and the best solution are to use hammer and use force and use nail to put him on the cross like Jesus that will now solve the problem. Then what will the lay people do if the people we are looking on to be the custodians of morality could behave in this way?”, he asked. “I read the interview of the PPRO of the Enugu state police command. It was clear and glaring that they were fighting the battle of the bishop and not combating crime because the Rev. Father did not commit any crime and they went into the church and stripped him naked, All what I am telling you is first hand information. I went to the prison and discussed with him, they brought him down, tortured him, and handcuffed him”, Nnaji disclosed. “Police is now doing the fighting of the bishop. It is obvious. But they have succeeded in bringing a lot of condemnation to the bishop because nobody is happy with the bishop, no matter the offence the Father had committed. “How can policemen go to a place to arrest a Reverend Father without even giving him an invitation? He has been visiting the state CID. This time around they packaged themselves in a vehicle that has no inscription of police, a vehicle that has nothing to show that they were policemen and the man had suffered kidnap attempts in the past by the same source of people who planned this one”, Nnaji concluded. Meanwhile, women of Mmaku numbering over five hundred stormed the Enugu Government House demanding the release of Father James, noting that he had done nothing and police should focus on combating crime. They equally visited media houses in the state in the Edinbugh Rd neighbourhood which has a high concentration of print media offices. The protesters alleged that the Bishop was fighting Fr. Ani because he refused to remit monies realized from the church to the Diocesan office. “The Bishop is not happy that he is using the money to develop the church”, the protesters told journalists. The women in a protest letter to Governor Sullivan Chime signed by Chairperson of CWO, Mrs. Cordelia Orjioke, Georgiana Chukwuobasi on behalf of the women of Mmaku prayed the governor to come to their aid and save the community from distortion. They urged the governor that they want their priest released from detention because they did not see anything bad he did other than that he did not allow the bishop and parish council members to siphon the church fund for personal uses. All effort to get reaction of Awgu Diocese or from Bishop John I. Okoye has failed as the Bishop has refused to reply test messages sent to his personal mobile phone or his e-mail. Also calls put to his mobile phone weren't answered for more than a week.